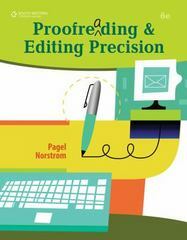 Proofreading and Editing Precision (with CD-ROM) 6 Edition Write better and succeed! PROOFREADING AND EDITING PRECISION gives you the tools to turn in perfect documents, whether it's for class or work. First PROOFREADING AND EDITING PRECISION gives you a short review of grammar rules, and then it gets quickly into its activity-oriented learning system. Plus, each topic is coupled with practice using real world documents formatted in Word 2007, so you'll get a head start on workplace success.